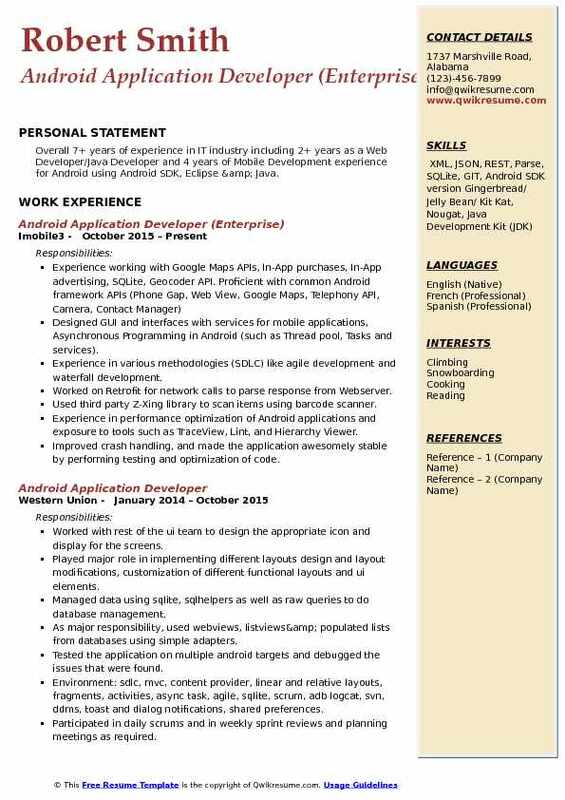 Android Application Developer Resume builds mobile applications for Android platform with roles and responsibilities that include designing applications for various devices, collaborating with cross-functional teams in defining, designing and shipping new features, working with outside data sources or API’s, unit-test coding, working on bug fixing, enhancing current application performance, discovering, evaluating and implementing innovative technologies and proposing solutions to maximize mobile application performance. 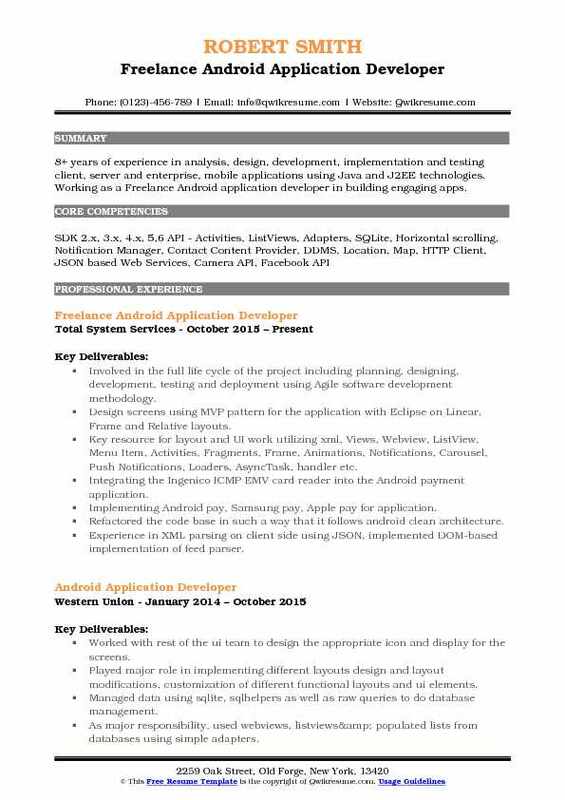 Required qualifications needed for this job post are proven software development and Android development skills, experience in Android SDK, third-party libraries, API’s, remote data experience via REST and JSON, knowledge of general mobile landscapes, architecture, and latest emerging technologies. Employers select resumes that make a display of at least a Degree in Engineering, IT or Computer Science. 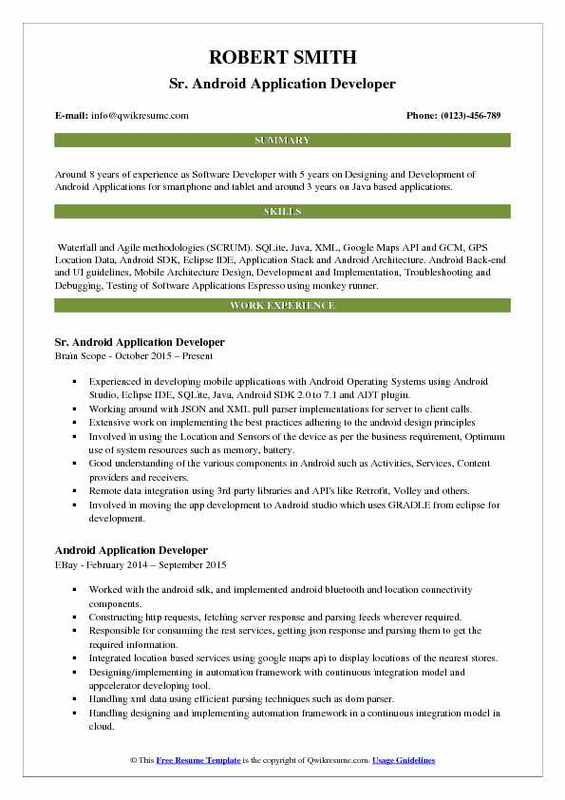 Objective : Over Seven (7+) years of software development experience with 3+ years of exclusive experience in Android Application development with Android SDK, Android NDK, Eclipse IDE, along with Android ADT plug in developing Native WEB and Hybrid applications. Participated in mobile development phases like Designing, Enhancements, Bug-fixing and maintenance of the Application. Android application development using Java, XML, JSON, GSON, SQLite, Fragments, RetroFit & Picasso. Focused on implementing rich user interface per UI/UX and Google's Material Design specifications. Maintain the Session Management for the app and Supporting screen orientations (landscape and portrait). Extensively utilized Retrofit library with OkHttp for API calls; Used the Picasso library for image caching. Designed efficient UI using SearchView, TabLayout, VideoView and ReceylerView. Worked on Push Notifications using FCM and integrated it in to the application to send notifications to the users. 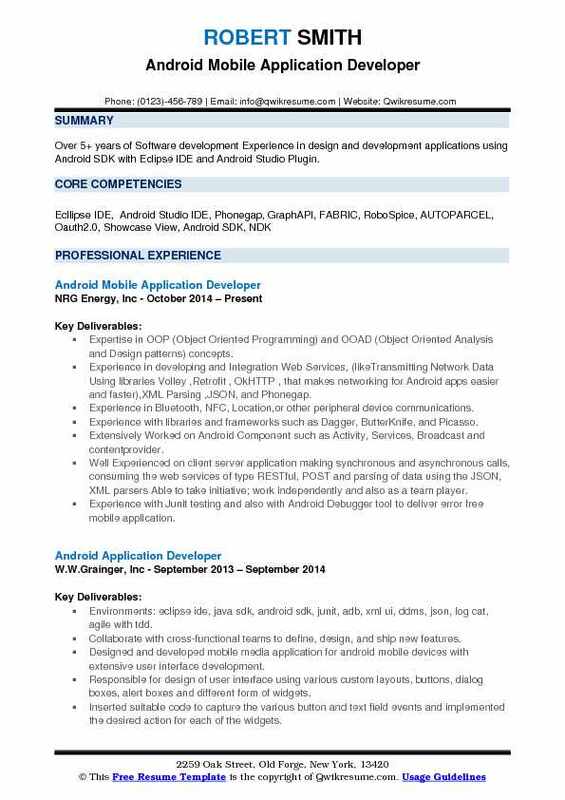 Objective : Over 5+ years of Software development Experience in design and development applications using Android SDK with Eclipse IDE and Android Studio Plugin. Expertise in OOP (Object Oriented Programming) and OOAD (Object Oriented Analysis and Design patterns) concepts. Experience in developing and Integration Web Services, (likeTransmitting Network Data Using libraries Volley ,Retrofit , OkHTTP , that makes networking for Android apps easier and faster),XML Parsing ,JSON, and Phonegap. Experience in Bluetooth, NFC, Location,or other peripheral device communications. Experience with libraries and frameworks such as Dagger, ButterKnife, and Picasso. Extensively Worked on Android Component such as Activity, Services, Broadcast and contentprovider. Well Experienced on client server application making synchronous and asynchronous calls, consuming the web services of type RESTful, POST and parsing of data using the JSON, XML parsers Able to take initiative; work independently and also as a team player. Experience with Junit testing and also with Android Debugger tool to deliver error free mobile application. 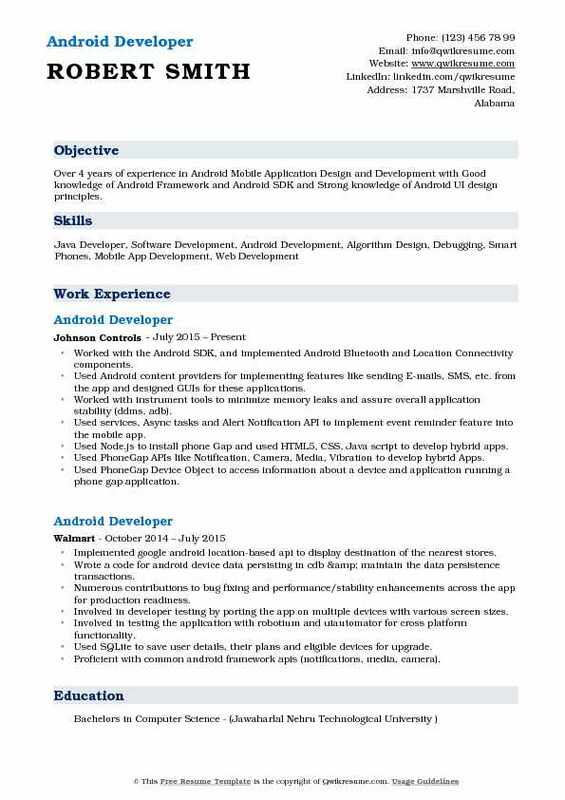 Summary : Around 8 years of experience as Software Developer with 5 years on Designing and Development of Android Applications for smartphone and tablet and around 3 years on Java based applications. Skills : Waterfall and Agile methodologies (SCRUM). SQLite, Java, XML, Google Maps API and GCM, GPS Location Data, Android SDK, Eclipse IDE, Application Stack and Android Architecture. Android Back-end and UI guidelines, Mobile Architecture Design, Development and Implementation, Troubleshooting and Debugging, Testing of Software Applications Espresso using monkey runner. 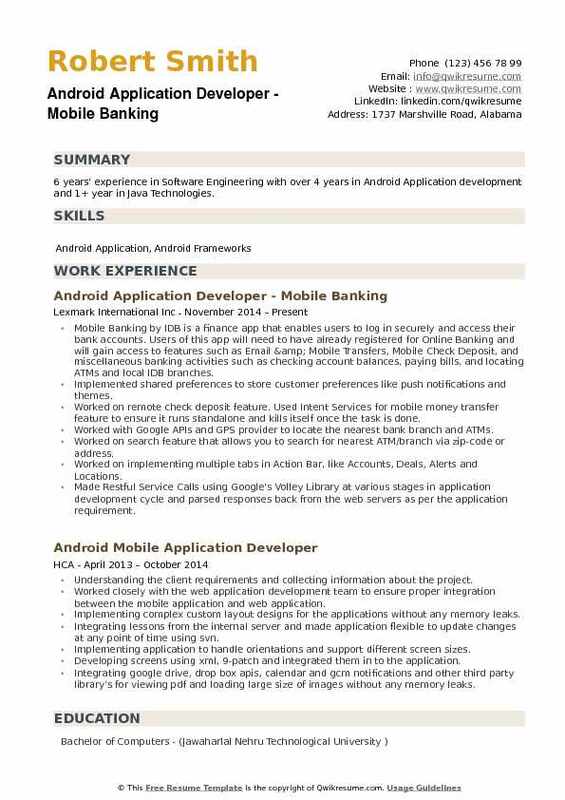 Experienced in developing mobile applications with Android Operating Systems using Android Studio, Eclipse IDE, SQLite, Java, Android SDK 2.0 to 7.1 and ADT plugin. Working around with JSON and XML pull parser implementations for server to client calls. Involved in using the Location and Sensors of the device as per the business requirement, Optimum use of system resources such as memory, battery. Good understanding of the various components in Android such as Activities, Services, Content providers and receivers. Remote data integration using 3rd party libraries and API's like Retrofit, Volley and others. Involved in moving the app development to Android studio which uses GRADLE from eclipse for development. Involved in Mobile Engineering, Mobile Security and Mobile policy development. Responsible for developing the Android UI layouts (Linear Layout, Relative Layout) and hybrid application user interface using HTML5, CSS3. Responsible for developing the user login screens and design the Context menus based on the Android Menu Navigation, Tabbed Navigation control and Action Bar Control. Developed the caching module that caches User profile in SQLite. Used both SQL Helpers as well as Raw Queries. Worked on multi-threaded development on android platforms froyo to lollipop. Developed the database wrapper functions for data staging and modeled the data objects relevant to the mobile application. Responsible for testing the application on various android devices and debugging the issues using ddms and logcat. 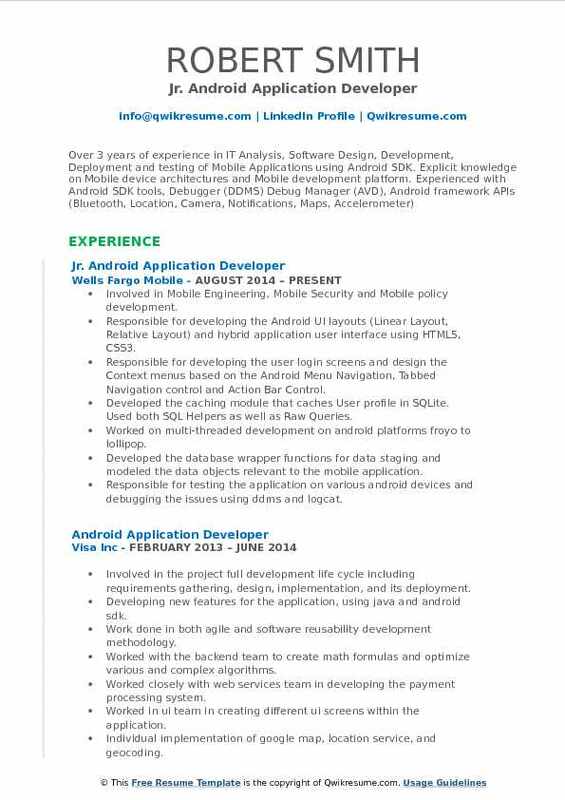 Objective : 2+ years of experience in Mobile Application development using Android Technologies. Extensive experience in design, development and deployment of Android Applications. Proficient with Java, Android SDK and various versions of Android OS. Skills : Development Tools: Android Studio, Eclipse, Android SDK, Programming Languages: C, C++and JAVA. Ubuntu; Baas (Backend As A Service): Google Firebase, Web Technologies: JSON, REST, XML, SOAP. Database Services: SQLite, SQL Version Control: Git, SVN, TFS. Developed responsive web pages/app development for desktop, tablets, mobile using latest web and mobile development technologies. Experience with integration of Android Third party API's like Location Based Services(LBS), Google Map, Google Analytics, Push Notification, Bluetooth API, Retrofit (Square Up), Spring for Android, RESTful template, Volley library, Dagger2.0. Experience in design and development of enterprise Mobile Native and Hybrid applications using PhoneGap/Cordove platform. Solid understanding of interfacing Mobile App to backend system using RESTFUL Web Services, using XML/JSON and OAUTH v0 and v2.0 API. Used Quality center and followed the defect workflow during the defect resolutions. Involved in mobile application performance testing along with Functional and regression tests. Responsible for Peer Code Review, Defect Resolutions. Objective : Over 4 years of experience in Android Mobile Application Design and Development with Good knowledge of Android Framework and Android SDK and Strong knowledge of Android UI design principles. Worked with the Android SDK, and implemented Android Bluetooth and Location Connectivity components. Used Android content providers for implementing features like sending E-mails, SMS, etc. from the app and designed GUIs for these applications. Worked with instrument tools to minimize memory leaks and assure overall application stability (ddms, adb). Used services, Async tasks and Alert Notification API to implement event reminder feature into the mobile app. Used Node.js to install phone Gap and used HTML5, CSS, Java script to develop hybrid apps. Used PhoneGap APIs like Notification, Camera, Media, Vibration to develop hybrid Apps. Used PhoneGap Device Object to access information about a device and application running a phone gap application. Summary : 9 Years of experience in Design, Development, Implementation and testing of Client Server applications, which includes 5+ years of mobile applications development in Telecom, Retail and Banking using Android. 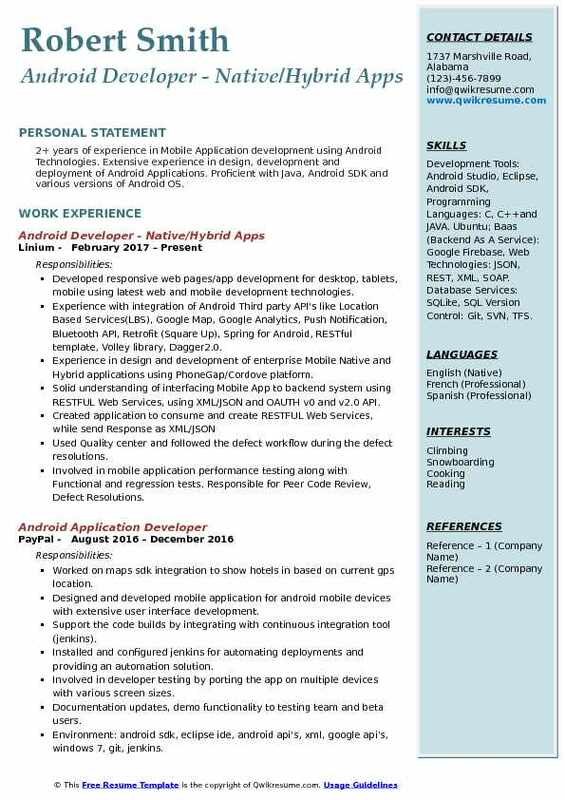 Skills : Android SDK & NDK, Java, Event Bus, Butter Knife, Bar-code scanning, Bluetooth, Printer SDK, Social SDK integration (Facebook, Twitter, YouTube API, google API, FCM etc.) Angular JS, Corova, HTML5, MJ Query, JS, CSS, JSON, XML, JIRA, SVN, GIT, GERRIT, SQLite, J2me, J2ee, SQL Server and Instruments. Contributed to the full development lifecycle of mobile phone applications from planning, Requirements gathering, development, testing, launching, and porting, to maintenance/code enhancement. Expert knowledge in Web Services, JSON, Android Studio, Eclipse IDE, SQLite database, Activities, Services, Broadcast Receivers, UI Designing. Developed the Reusable User Interface & business details, and designing the app with MVC pattern and improving it for better functionality and used Agile Methodology(JIRA). Used the Bluetooth APIs to connect and communicate with another Android Mobile. Using Web Services and networking to parse JSON online data from server. Worked on the NDK in addition to SDK to integrate the native code to enhance the performance of CPU intensive operations. Responsible for refactoring existing code and redesigning structures to improve performance of the entire app. Summary : 8+ years of experience in analysis, design, development, implementation and testing client, server and enterprise, mobile applications using Java and J2EE technologies. 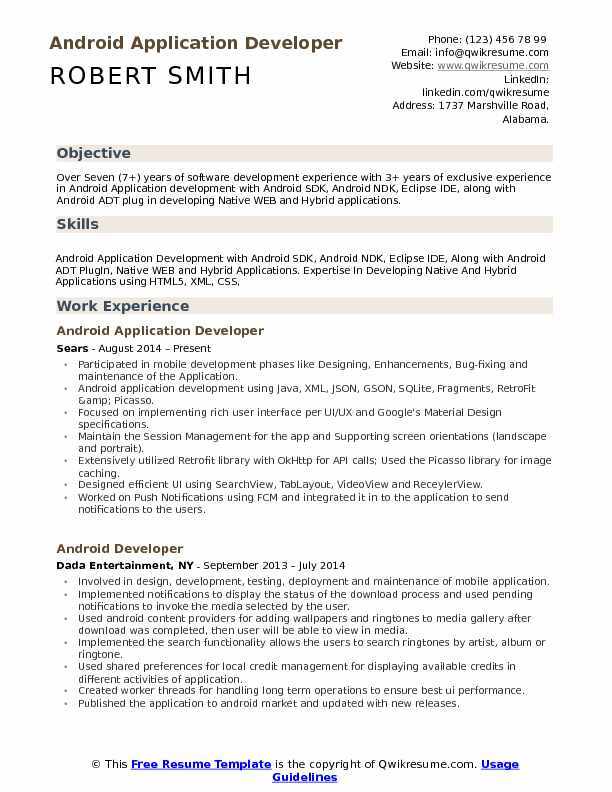 Working as a Freelance Android application developer in building engaging apps. Involved in the full life cycle of the project including planning, designing, development, testing and deployment using Agile software development methodology. Design screens using MVP pattern for the application with Eclipse on Linear, Frame and Relative layouts. Key resource for layout and UI work utilizing xml, Views, Webview, ListView, Menu Item, Activities, Fragments, Frame, Animations, Notifications, Carousel, Push Notifications, Loaders, AsyncTask, handler etc. Integrating the Ingenico ICMP EMV card reader into the Android payment application. Implementing Android pay, Samsung pay, Apple pay for application. Refactored the code base in such a way that it follows android clean architecture. Experience in XML parsing on client side using JSON, implemented DOM-based implementation of feed parser. 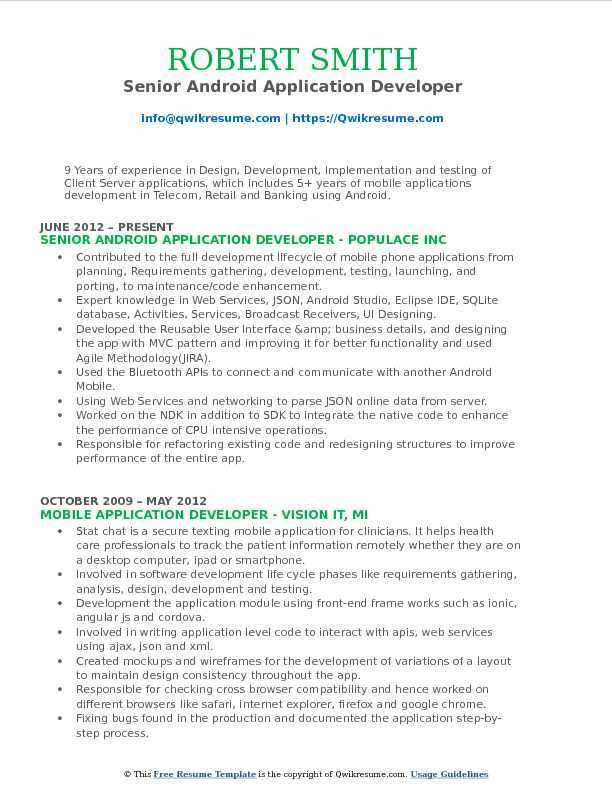 Summary : Overall 7+ years of experience in IT industry including 2+ years as a Web Developer/Java Developer and 4 years of Mobile Development experience for Android using Android SDK, Eclipse & Java. Designed GUI and interfaces with services for mobile applications, Asynchronous Programming in Android (such as Thread pool, Tasks and services). Experience in various methodologies (SDLC) like agile development and waterfall development. Worked on Retrofit for network calls to parse response from Webserver. Used third party Z-Xing library to scan items using barcode scanner. Experience in performance optimization of Android applications and exposure to tools such as TraceView, Lint, and Hierarchy Viewer. Improved crash handling, and made the application awesomely stable by performing testing and optimization of code. Objective : 6 years' experience in Software Engineering with over 4 years in Android Application development and 1+ year in Java Technologies. Mobile Banking by IDB is a finance app that enables users to log in securely and access their bank accounts. Users of this app will need to have already registered for Online Banking and will gain access to features such as Email & Mobile Transfers, Mobile Check Deposit, and miscellaneous banking activities such as checking account balances, paying bills, and locating ATMs and local IDB branches. Implemented shared preferences to store customer preferences like push notifications and themes. Worked on remote check deposit feature. Used Intent Services for mobile money transfer feature to ensure it runs standalone and kills itself once the task is done. Worked with Google APIs and GPS provider to locate the nearest bank branch and ATMs. Worked on search feature that allows you to search for nearest ATM/branch via zip-code or address. Worked on implementing multiple tabs in Action Bar, like Accounts, Deals, Alerts and Locations. Made Restful Service Calls using Google's Volley Library at various stages in application development cycle and parsed responses back from the web servers as per the application requirement. Worked on updating and distributing the app via Google Play.